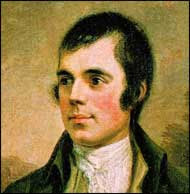 It's Burns' Day today, so it is only fitting that he becomes the first poet to feature twice in the Anthology strand of my blog. The poem (well, song) I've chosen is A Man's a Man for A' That. It's written in Dialect Scots which may make it a bit dense to interpret but it's central message is that whatever someones station in life, a man is still a man and a man is just a man. The poem ends with the hope and prayer that one day mankind across the world shall see themselves as brothers, regardless of whatever else happens. I've been put in mind of this recently when thinking about the tragedy in Haiti. Overseas aid is sometimes questioned, particularly when there are so many competing demands on public (and personal) funds. Those who do question it would do well to take the message of this poem to heart - and to remember that "there but for the grace of God, go I". Wear hodding grey, an a' that? It's now 9 days on from the earthquake that devastated Haiti. In amongst the tensions and recriminations that arise from the slow delivery of aid - caused in no small part by the destruction of the country's infrastructure and the effective collapse of the government - it is easy to question the point of donating. Will the money just end up sloshing around and never reach the people it is intended to help? The problems with aid delivery are not insurmountable and will not last forever. While lessons may have to be learned, mounting such an operation at short notice in such extreme circumstances was always going to be problematic. The aid will be required for a long time to come, long after the story ceases to be news. There are now, thankfully, signs that the aid is starting to get through. The main port is reported to have reopened, which should greatly help the aid effort. This post has been written to urge you to join those who have collectively raised £38m - you can donate here. If you're reading this outside the UK, please donate to your own local appeal, if you can. You may also like to take further action by signing Oxfam's petition to bring forward the programme to cancel Haiti's international debt. This would give the country a better chance of (re)building its infrastructure and establishing effective governance than would otherwise be the case. 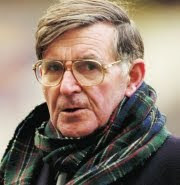 The legendary Rugby commentator Bill McLaren died today. For anyone with even a passing interest in Rugby Union in the second half of the 20th Century his was a familiar - and authoritative - voice. He was born in Scotland's Rugby heartlands and played the game himself until he had to give up after contracting TB. After this enforced departure from playing the game, he moved into commentating in 1953. He pursued this new career for almost 50 years, only retiring in 2002. During this time he acquired his title as The Voice of Rugby, as well as being awarded the CBE, OBE and MBE. His commentaries were alive with wonderfully descriptive phrases. His knowledge of the game, it's laws and it's history was encyclopedic. His preparation for each match was extensive ensuring he had all the background, statistics and information he needed at his fingertips. Most of all he had a real passion and love of the game. For me he was the epitome of what a sports commentator should be: Someone who loves their chosen sport, knows it inside out and has the ability to communicate both to their audience. He was courteous and professional, had a wonderful voice for listening to and was both informative and entertaining. It was sad to hear of his death, but his memory will live in a generation (or two) of Rugby fans for whom he will always be the definitive voice of the game. I recently downloaded the Stumple Upon add-on for Firefox. If you've not come across it, it's an application that will take you to various websites, blogs and videos that you may like based on your interests. Earlier today I was browsing my recently acquired copy of the BBC book "The Nation's Favourite Poems". Published in 1996 (and reprinted every year since), this is a compilation of the top 100 poems in a poll conducted for National Poetry Day in 1995. It's a lovely anthology of a wide range of poets and styles. The favourite poem in the poll was Rudyard Kipling's "If", to which I may return in a future post. Today I've chosen W.H. Auden's "Twelve Songs, IX" better known as "Funeral Blues". Like many people, I was introduced to this by John Hannah's recitation in Four Weddings and a Funeral, and it remains a firm favourite of mine as well as the nation! Although I'd heard of this, until yesterday I hadn't actually heard Jamie Cullum's version of "Don't Stop The Music", originally by Rhianna. Have a listen - although not usually a Cullum fan, I think this is storming! It's that time of the year - okay, it WAS that time of the year about 2 weeks ago - when one's mind turns to the various good intentions with which the road to hell is to be paved. I've long been suspicious of forming new years resolutions on the basis that they always seem to be setting one up for failure. I used to, however, establish some loose aims and objectives. I tried to make these achievable and measurable. Some were relatively trivial and some were perennial favourites - often involving losing weight and getting fit! For many people getting a new job is a key aim at the turn of the year and I am in this happy position. Having received an offer just before Christmas, I accepted it at the beginning of the year and I start next month. So that's one of my non-resolutions already achieved. Some of these will be helped by my new work - it involves walking more and getting the train which should lead to weight loss and more books read! Some will involve making time and a degree of willpower. And some will depend on good, old-fashioned self-discipline. So here's to a new year and to success any aims and objectives I do set myself! 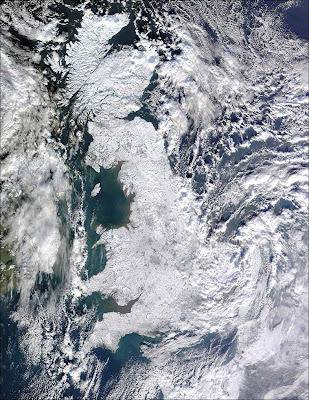 This picture of a frosty Britain was taken by NASA's Terra satellite today. You may have seen this elsewhere, as it's been quite widely used in various news outlets. I think it is such a brilliant image, however, that I thought I'd publish it here too! Over the past couple of weeks I've been enjoying various products I brought home with me after being away at Christmas. It is now an annual tradition that I raid Tesco (and normally the local bakers) for a range of Scottish "delicacies". Although I try not to be too parochial and I'm quite settled here in England there are nonetheless a few things I miss from home. Or rather, I miss the ability to buy them when I want them - even when I lived in Edinburgh I didn't necessary regularly eat the things that I now seem to crave! So, what was in my bag this year? A Mother's Pride Plain Loaf - Tall and thin bread with a thick crust at the top and bottom (though not on the sides) and a denser texture than normal bread - magic toasted and spread with soft cheese! Simmers' Butter Biscuits - Savoury biscuits great with butter and cheese or pate - or honey! Tunnock's Caramel Logs - Caramel Wafers are quite widely available, but I think I prefer these chocolate covered caramel biscuits which are rolled in toasted coconut! Scottish Black Pudding - Although Black Pudding is quite widely available, I prefer the Scottish type which lakes the lumps of lard that goes into the Northern England type. Haggis Slices - A practical way of cooking Haggis for breakfast - or sandwiches! Today is the fifth of January and I should be posting to Stephen's "5 on the 5th" as I normally do each month. Unfortunately, I've just sat down for a break and a surf and realised that it is, indeed, the 5th today and I haven't taken any pictures. One of my Christmas presents was a copy of the Uxbridge English Dictionary. Compiled from contributions made by panelists on the excellent Radio 4 programme "I'm Sorry I Haven't a Clue", it provides new definitions for old words. If you are not acquainted with ISIAHC, you can find more info here. I've now finished the second in Philip Pullman's His Dark Materials' Trilogy. The novel follows on directly from Northern Lights although the initial action is set in our own world and we are introduced to a new protagonist, Will. Pursued by mysterious men, he finds his way into a strange - and apparently deserted - city. There he meets Lyra who had crossed the bridge from here own world to this new one. Lyra is intent on investigating Dust despite the Alethiometer giving her a new mission - to find Will's father. Their story unwinds with travels between the world of the deserted city and the Oxford of our own world. There are also things afoot in the world from which Lyra comes which are of great import towards the end of the novel. Compared to the first novel, I felt this one was a little disappointing, as if Pullman had lost a little of his focus. The individual story seemed, somehow, incomplete while the arc storyline initially developed along the lines suggested by the first book before abruptly changing direction. I also felt as if the writing had lost some of the sparkle which distinguished the first book. So, it's on to the third book - The Amber Spyglass. My hope is that this will bring all the loose ends and undeveloped themes together in a book more like the first than the second. You can read my review for the first book, Northern Lights, here.